Calderdale Council is looking at how it can continue to deliver good quality library services for local people whilst also managing reducing budgets. They have issued the following update on the process. The way that people use libraries is changing. A full review of the current library service provision began in November 2017 and has included a full public consultation as well as discussions with library staff and trade unions. The review focused on the smaller, community libraries and almost 600 local people provided feedback. Calderdale Council’s Cabinet will now look at a number of options for the future of the library service, taking into account consultation feedback as well as the need to meet challenging saving requirements for the service of £160,000 by 2020. “Our consultation showed how important our libraries are to local people and we want to ensure that we can continue to provide a good quality, relevant library service which is fit for purpose. As part of the review, three community libraries have been identified which have significant repair needs and would be difficult and costly to repair. These buildings are in Bailiff Bridge, Walsden and on Beechwood Road in north Halifax. The recommended option for Cabinet is that the Council would continue to explore opportunities to relocate services at these sites or to move into alternative shared facilities if possible. Members will consider this and three other options for future delivery and determine which, if any, should be implemented. The future of the service will be discussed at the meeting of Calderdale Council’s Cabinet on Monday 5 November from 6pm at Halifax Town Hall. 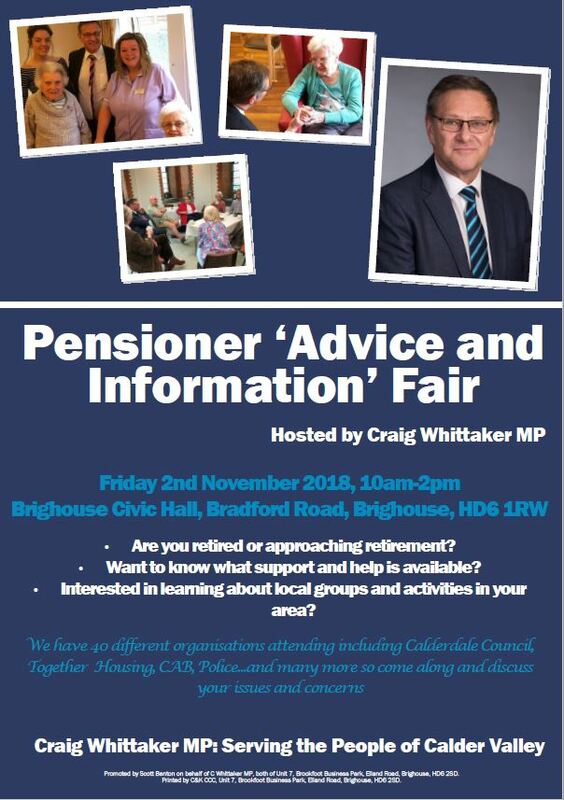 There will be a pensioner ‘Advice and Information Fair’ on Friday 2 November, 10:00am-2:00pm at Brighouse Civic Hall, Bradford Road HD6 1RW. Hosted by Craig Whittaker MP there will 40 different organisations attending including Calderdale Council, Together Housing, Citizens Advice and many more. It will give you a chance to find out what help, support and activities are available if you are retired or approaching retirement. This entry was posted in Facilities and Support, Financial & Poverty Avoidance Advice on October 26, 2018 by calderdaleforum50plus. The office at 1 King Street, Halifax HX1 1SR is open from 6:00pmon Fridays, Saturdays and Sundays, with the latest available appointments at 11:00pm. This entry was posted in Facilities and Support on October 2, 2018 by calderdaleforum50plus. 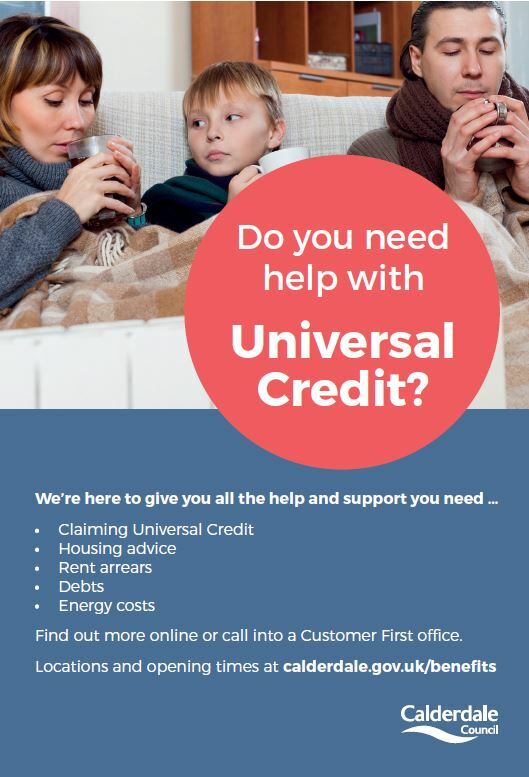 Calderdale Council are reminding people that they can find support with applying for Universal Credit by visiting a Customer First office. Important note: Complete an online self-referral form, if you have already claimed Universal Credit and you need help using the account or with budgeting. This entry was posted in Facilities and Support on September 3, 2018 by calderdaleforum50plus. Healthy minds is Calderdale’s local mental health charity, led by people who have personal experience of emotional distress. They believe that mental health is one aspect of a person’s life, not what defines them. With kindness and respect, together they create and provide opportunities for people to understand and build on their strengths to better achieve what they want from their lives. Join them for their 10th Anniversary Sponsored Walk! This entry was posted in Facilities and Support on August 21, 2018 by calderdaleforum50plus.